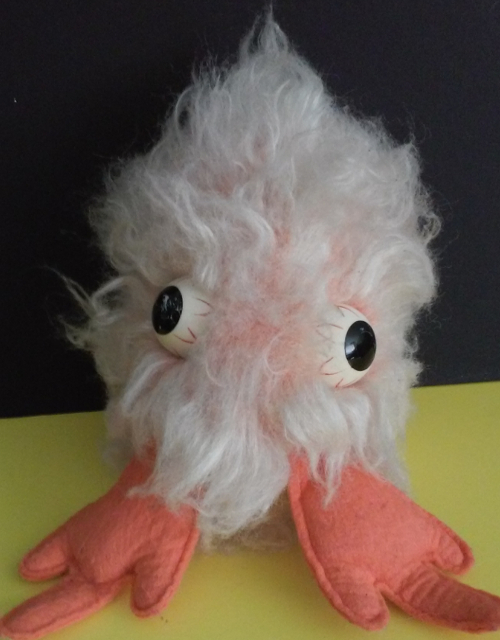 So, a little over five years ago I wrote (what I thought was) a throwaway blog post on this oddball stuffed animal from the 1960s called “Slurp” that I found at a thrift store. It was pretty difficult to find anything, but some Googling showed that it was produced by a company called Spectacular Products. Spectacular Products folded at some point and became Princess Soft Toys, a more traditional stuffed animal manufacturer that was a frequent staple of hospital and tourist trap gift shops. Since the writing of the original blog post, Princess Soft also dissolved in a complete mess of financial shenanigans. But that’s neither here nor there. 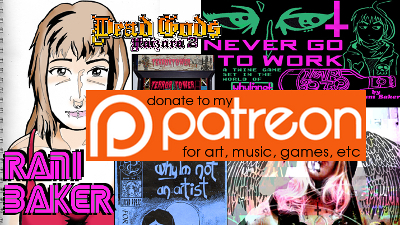 Apparently that blog post has been finding it’s way around various internet collectible fora, being the only post laying out any sort of history for the thing. Not sure if it was through that forum or just Google or what, but a particularly resourceful collector of these toys tracked me down from that blog post, contacting me through my Google+ profile attached to this site. We did some haggling, and unfortunately couldn’t reach a price we were both comfortable with for me to part with my Slurp (yes I still have the weird little thing). In the meantime, however, I managed to goad some background information about them. “These were made by an old company in my home town. Cannon Falls Minnesota. The company name was Spectacular Products. That’s my reason for the interest. Some people collect them because they were made in the 60’s – hippie era. 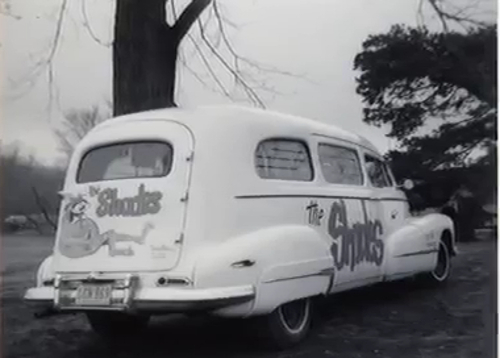 Some of the local high school kids who had a small band in the 60’s, probably influenced by beatnik music, like Dylan and the Beatles were, worked at this company making the Slurps. I’ll see if I can dig up an old photo of the band. They played at local fairs, and eventually went off to Viet Nam. One was killed. Unfortunately, I never got to hear any further about these “stories”, but the potential buyer did tip me off with this Youtube video of the band discussed in the anecdote. 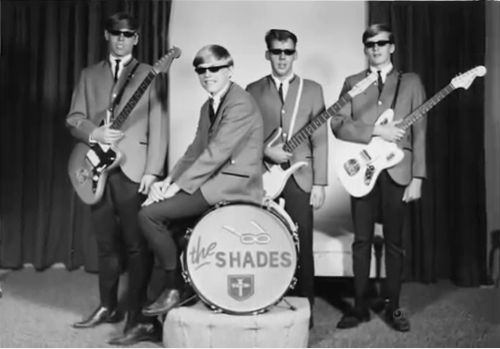 They were called The Shades, and get a load of their wicked station wagon. Apparently members of this band worked in the factory hand-stitching these toys. It’s entirely possible that one of them hand-stiched the one I still own, the company was just starting and most accounts say there were between 8-10 employees when they rolled out this toy as their first product. This entry was posted in 60s, Cannon Falls, Minnesota, Princess Soft Toys, Slurp, Spectacular Products, Stuffed Animals, Surf, The Shades, Vintage Toys. Bookmark the permalink. ← My Girlfriend Chloe Sagal’s Game "Virus Jigglin’ Fever" Got Greenlit On Steam! Suddenly I had an urge to Google “Spectacular Products” and see what I got. I came across your site, your story, and decided to add a little to it with some background on Slurp. Spectacular Products was started by Terry Mitchell and his father Robert. His father owned the Twin Cities Motel in New Brighton, Minn, having purchased it around mid-1958. I went to High School with Terry in the western suburbs of Chicago (LTHS) through our junior year, which was when he and his family moved to New Brighton. I visited Terry in the mid 1960’s on a business trip to Control Data Corp. Terry picked me up and drove me down to the plant in Canon Falls. 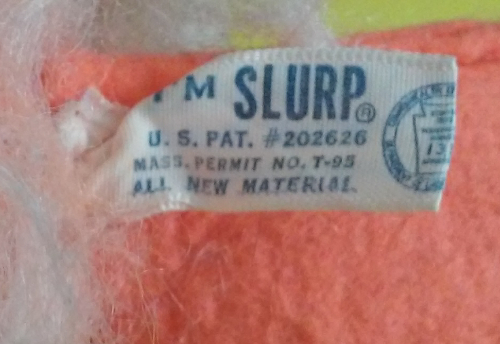 Slurp got its name from Terry’s youngest brother Jimmy. Jimmy was slurping his breakfast cereal one morning and the discussion led to the naming of the product. It was their first product. I do still have a Slurp that he gave me. I enjoyed reading your Slurp story. I have a Slurp. My sister gave it to me. It was hers. I just wondered how much they are worth. Although I love mine.